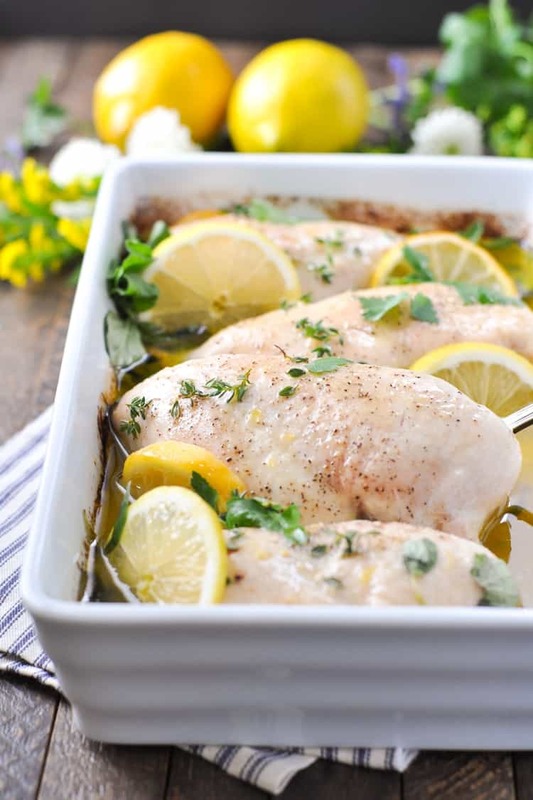 With just 10 minutes of prep and a few pantry staples, this Garlic and Lemon Chicken is a fresh, healthy, and easy dinner solution for those lazy days when you just don't want to spend much time in the kitchen! 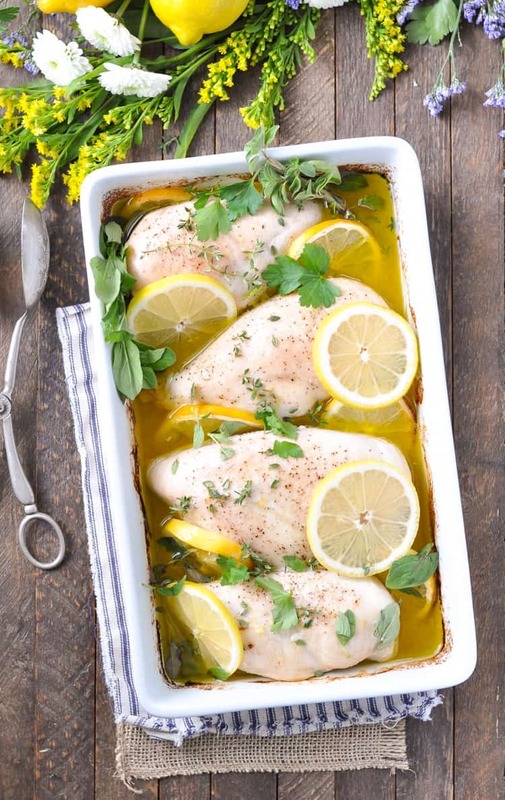 With just 10 minutes of prep and a few pantry staples, this Garlic and Lemon Chicken is a fresh, healthy, and easy dinner solution for those lazy days when you just don’t want to spend much time in the kitchen! I’m not the only one who often feels lazy when it comes to dinnertime, right? 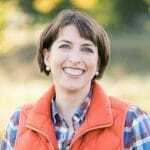 In fact, I typically rely on slow cooker meals, freezer meals, or dump-and-bake options for that very reason. When the clock strikes 5:00 p.m., my mind and body start to slowly wind down for the night. I’m definitely an early morning person, so I’m just exhausted after a full day of go-go-go. We get through the post-school homework and snack routine, and I’m about ready to put on a big fuzzy bathrobe and relax on the couch in my pajamas for the night! 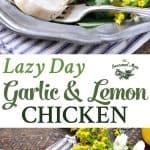 So in an effort to get something healthy and fresh on the table FAST, I pulled together this Lazy Day Garlic and Lemon Chicken. 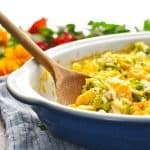 It’s bursting with flavor, it requires only 10 minutes of my time, and it’s perfect served over a bed of rice, a bowl of pasta, or a plate of crisp green salad. I like to toss the pan sauce with warm pasta and Parmesan cheese, or drizzle the reserved dressing over salad greens. It’s a versatile meal that’s also affordable, nutritious, and most importantly — EASY. Embrace your lazy evenings, pour yourself a glass of wine, and snuggle up on the couch. 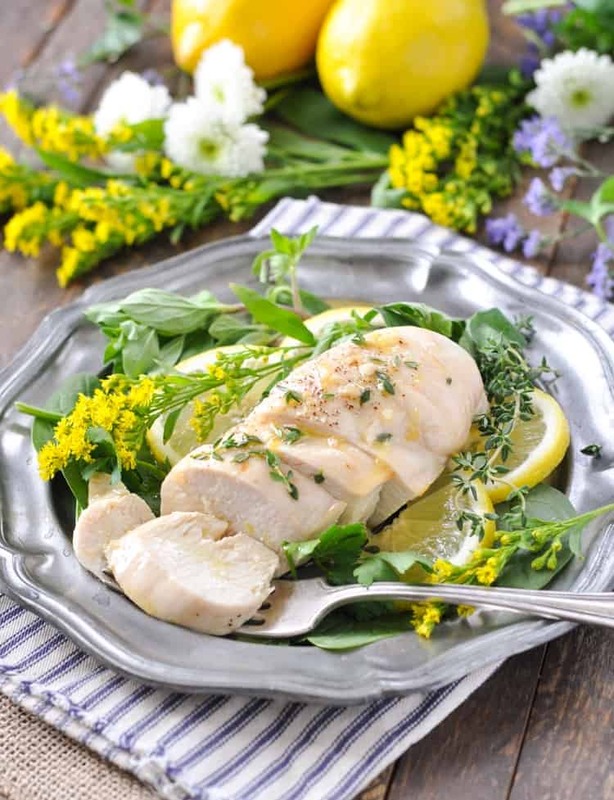 There’s no need to order takeout or microwave a frozen entree — this Garlic and Lemon Chicken is just as simple, and much more delicious! Cooking Just for Two? This is a very easy recipe to cut in half! 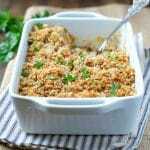 Just use exactly half of all of the ingredients and bake the chicken in a small dish that comfortable holds just two chicken breasts. The rest of the cooking instructions are the same! Want to Prep Ahead? I like to make the lemon sauce in advance. You can marinate the chicken in a large Ziploc bag with about 3/4 of the sauce for a few hours in the refrigerator. When it comes time to bake the dinner, just dump the chicken and marinade into the dish! Season with salt and pepper, add fresh lemon slices, and pop it in the oven as instructed. Prepare the lemon sauce by placing all of the ingredients in a large jar with a lid and shaking vigorously until completely combined (alternatively, you can whisk in a bowl or quickly mix in a blender). Spray a large baking dish with cooking spray. Pour about ¾ of the Lemon Sauce into the bottom of the dish, setting the remaining sauce aside for later. 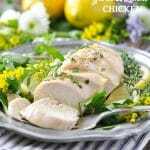 Place chicken breasts in the sauce, season with salt and pepper, and tuck lemon slices among the chicken. Bake, uncovered, for 30-40 minutes (depending on the size of the chicken breasts). When the chicken is cooked through, allow the meat to rest for about 5-10 minutes before slicing and serving. 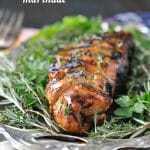 Drizzle chicken with reserved sauce and garnish with fresh herbs. 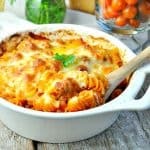 This is delicious tossed with pasta, served over rice, or even topped on salad. Nutrition information for chicken and all of the pan sauce and reserved dressing. If you eat less sauce, the stats will change drastically. I always feel lazy when it comes to dinner time! I blame it on the fact that I’m in the kitchen most days for too long! 🙂 What a pretty dish, Blair! I love the garlic and lemon combo. 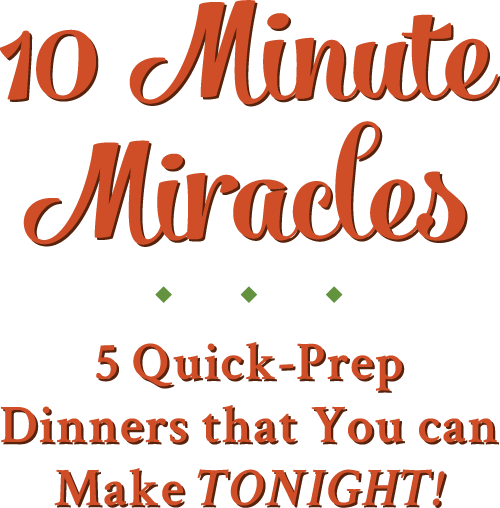 Sounds so perfect for spring and busy weeknights! That’s great! I hope that you love it, Cynthia! I agree — the sauce would be great with fish as well! Thank you for going to the extra trouble. I really look forward to this dish. look forward to rathe than a chore. Thank you so much. Loved the lemon garlic sauce! I cooked up some penne to go with this, and did broccoli as a side. At the last minute, I decided to mix it all in together with the chicken and it was SOOOO good. Restaurant-quality. Thanks for another delicious dinner! That’s perfect! I’m so glad that you enjoyed it — your meal sounds delicious! Thanks for letting me know, Meredith! 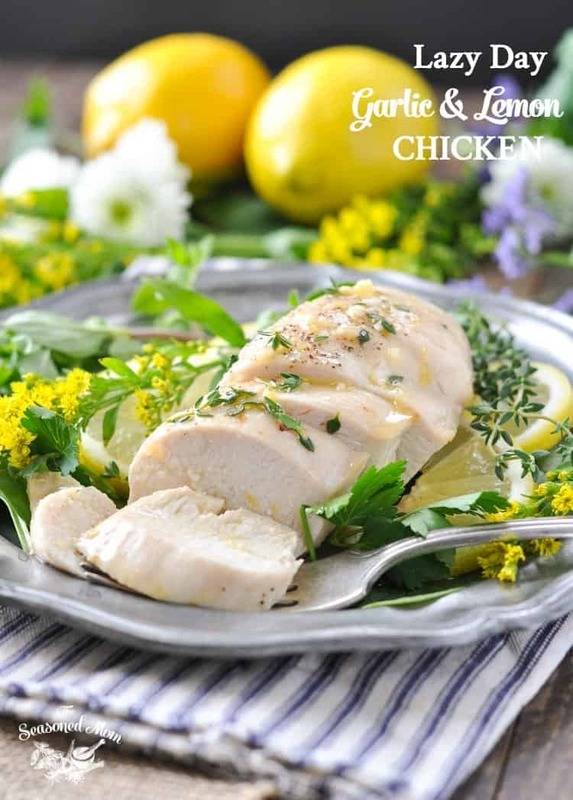 This simple chicken dish sounds so delicious, perfect with some roast potatoes!